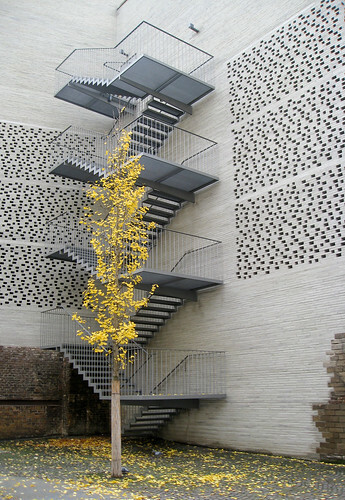 Zumthor_Conf_Rome_3, originally uploaded by Antonio Cibelli. Maybe. In any case, as the designer of some of the subtlest and most admired buildings of the last quarter-century, Zumthor has hardly been toiling in obscurity. But he has eschewed the flamboyant, billboard-on-the-skyline, globe-trotting celebrity persona, setting himself apart from, and in his own mind clearly somewhat above, some of his more famous colleagues. His works, even from the most superficial perspective, differ from Frank Gehry’s or Zaha Hadid’s or Jean Nouvel’s or Norman Foster’s, for starters, because they are not flashy: they often don’t grab you at all at first glance, being conceived from the inside out, usually over many painstaking years. Moreover, because Zumthor runs a small office and doesn’t often delegate even the choice of a door handle, he hasn’t taken on many projects, and most of the ones he has completed aren’t very big. 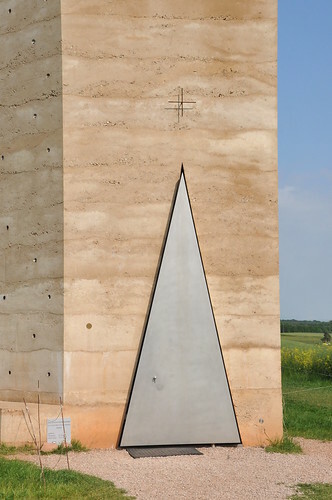 A good place to sense what Staudt means is Zumthor’s Bruder Klaus chapel, in western Germany. It rises from a modest ridge above the farming village of Wachendorf. In winter, a few deer gambol through crunching snow from the surrounding forest, sniff then retreat. The uphill trek from the nearest road, across an empty field, acts like a natural decompression chamber before the first glimpse of the building: an abrupt concrete block with an odd triangular door on one end. Inside, pitched walls lead to a sort of cave or teepee with a high, teardrop oculus, open to the sky. A handful of people fit comfortably in the space, but ideally it’s made for one or two. Bruder Klaus was a hermit. There are no windows; there is no electricity or running water. 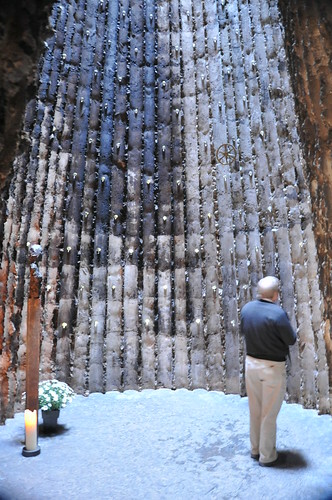 Where a central altar might be, there’s a shallow pool of water, formed of rain and snow falling through the oculus. Small bottle-glass portholes add points of light, and undulating walls bear the imprints of 112 spruce trees, chopped down from Zumthor’s clients’ farm, then slowly burned, leaving blackened traces in the thick concrete. 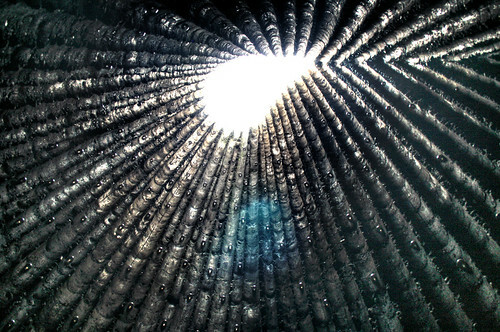 “A small space to be quiet” is how Zumthor described the chapel to me. For the few solitary minutes I spent inside it, it seemed like the most peaceful and secret spot on earth. 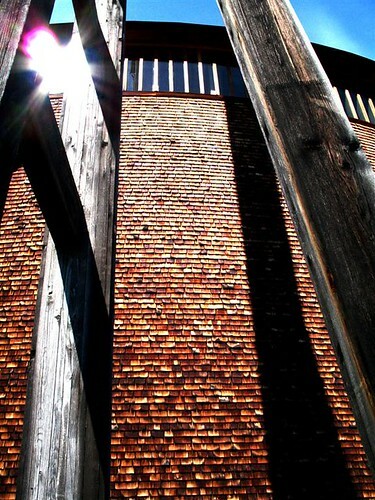 The story goes that a family of devout farmers wrote to Zumthor, out of the blue, having hardly a clue of who he was, knowing only that the archbishop in nearby Cologne had hired him to plan a museum, and they asked him to build a field chapel for them — and Zumthor agreed, as long as they could wait a decade. I visited the family at their home. They turned out not to be yokels but prosperous and sophisticated, and they were perfectly aware of who he was. 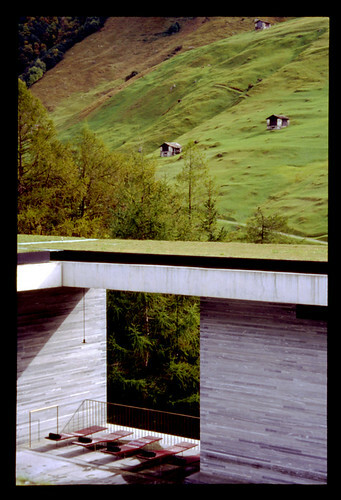 Zumthor, who waived his fee because he found the project intriguing, and who devoted years, as it turned out, to devising the chapel with a construction method that would allow villagers to build it themselves, house-raising-style, now grumbles about how much the chapel ultimately cost him, and how his clients kept trying to cut corners, although he said they ultimately acceded to everything. Still, the original story has a kernel of truth, because with Zumthor a client is entering, firstly, into a relationship that entails Talmudic discussions and Job-like patience. Ask for an appointment with him, and you may get no response for days or weeks. He employs no publicist, dedicates no aide to media relations. Zumthor has long done what he wants and only what he wants. This has been his virtue and burden, inviting comparison with the late American genius Louis Kahn, another proud perfectionist who built just a few buildings, making the most of a coterie of committed clients to leave behind a handful of masterpieces. Zumthor has often said that the biggest disappointment of his professional career — an even bigger loss for Berlin, as it turned out — was the abandonment several years ago of his plan for a museum on the site of the former Gestapo headquarters. Battling for more than a decade with a shifting, indifferent roster of midlevel government bureaucrats, he found he “had no partner,” as he put it. Building finally stalled when German political will faded after the opening of a Jewish museum and Holocaust memorial in the city made the project seem less pressing. Assuming Zumthor does find a sympathetic partner, though, what gets built will have invariably emerged from a long and complicated gestation process. In Bregenz, Austria, Rudolf Sagmeister, the curator of Zumthor’s celebrated Kunsthaus there, which opened in 1997, described how Zumthor parried with locals for ages to get what he wanted. “It is the dream of architects, especially the ones who hate their lives, to do just a few things but perfectly, each thing a milestone, so architects envy him,” Sagmeister said. We were seated in a cafe beside the museum, facing a small square, which Zumthor also designed, where a pair of toddlers played in a patch of cold winter sunlight. We arrived at the Vals spa, where his wife, Annalisa, met us in the hotel bar. An attractive, poised woman, she seemed a forbearing partner for a man whom associates describe, not altogether unsympathetically, as demanding and self-critical. The hotel was a sleek but nondescript Modernist box, which Zumthor distilled to its ’60s essence, and to which he added his spa, like the Baths of Caracalla to a Days Inn. Built into the mountainside as a maze of lofty, exquisitely proportioned volumes, with heavy, bespoke walls made of finely cut slabs of local stone fitted together like a jigsaw puzzle, the spa invests ordinary leisure-time bathing with a sacramental gravity. It lends existential weight to even the simplest, most banal rituals — walking from room to room, looking out a window, reclining on a bench, gazing up at the sky or hearing the splash of water and the echo of footsteps. Bathers move like supplicants through wet stone chapels. A local businessman was sipping a beer, listening. “Now it’s our Matterhorn,” he volunteered. When I tried out the spa myself early the next morning, a few bathers were already soaking in deep contemplation. The baths, all of them different, each came as a surprise, appearing around a corner, or down some steps. 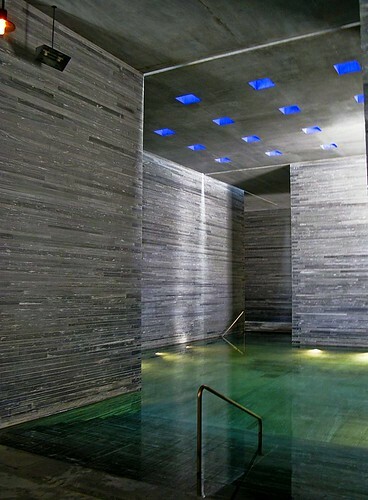 Zumthor had talked about the “longing” of spaces to be discovered. In Cologne, the new structure he built for the Kolumba museum, which houses the archdiocese’s art collection, shares its site with the ruins of a Gothic church bombed during World War II and with a chapel, a 1950s period piece by Gottfried Böhm. Zumthor embraced the ruins and the chapel, wrapping a perforated brick facade like a cloak around both, and also around the museum, the discreet entrance to which opens onto galleries that, as with the baths, are all distinct but feel custom-made for the art, just as the art, uplifted by the most sensitive architecture, feels as if it were made for the rooms. Later that morning, we drove to a pair of small wooden houses he recently completed for himself and Annalisa near a peak above Vals. She grew up at these heights. A wood house was her dream. For his part, Zumthor welcomed an excuse to rethink the local log-cabin design. He stuck with classic wood-beam construction, but in place of the old four-walled box structures that produced small, dark rooms, he essentially turned the boxes into towers spanned by broad sheets of glass that allowed for wide-open spaces framing spectacular views. 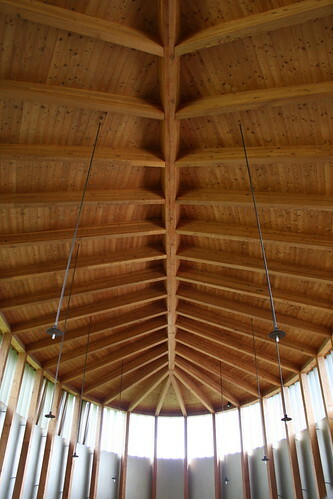 You can feel exactly what he means if you travel an hour or so away to Sumvitg to see another chapel he designed, nearly a quarter of a century ago. An avalanche during the mid-1980s destroyed the Baroque chapel there. The village priest held a competition for its replacement. Zumthor’s plan called for a pointed wedge of dark shingled wood clinging to a mountainside, like the mysteriously stranded bow of an ancient ship, with clerestory windows, a modest single door atop simple concrete steps and two bells perched on a slender tower. The interior, light-bathed and exalting, suggests the ship’s galley: a wooden jewel box with a creaky wood floor. He looked around. “It’s so touching to see after all these years,” he decided. “I told the priest, ‘What I can offer you is the memory of the church I had as a boy.’ ” At that moment, he caught sight of a cheap wood cabinet, crammed near the front door, installed without his approval, he said. “But it is O.K.,” he told himself. Then he opened the front door, listening for the satisfying clunk of the door handle, squinted into the winter sun and crunched back through the snow toward the car. Months later, Zumthor told me that he agreed to take on the house for Maguire and Meyer. Maguire had requested a basketball court, Zumthor said. Zumthor imagined gardens instead, an Alhambra in Hollywood. I said nothing, already knowing who would win that argument. That this very Swiss architect should be building not just a movie star’s house but also rethinking a major public space for this quintessentially American city might seem odd. Zumthor spent time in Los Angeles years ago, it turns out, and like so many Europeans fell for its foreignness. But more than that, Los Angeles, like Zumthor, has cultivated its own idiosyncratic take on Modernism, steeped in locale: in landscape, climate, sunlight, space. Zumthor is, in fact, strangely at home there. Govan spoke up. He said the museum had certain treasures, which needed special treatment. How might the collections be reorganized around them? he asked. Might a new layout lead to new ways of telling art history? The conversation slowly devolved into issues of zoning, parking and gas lines and away from time, trees and treasures. 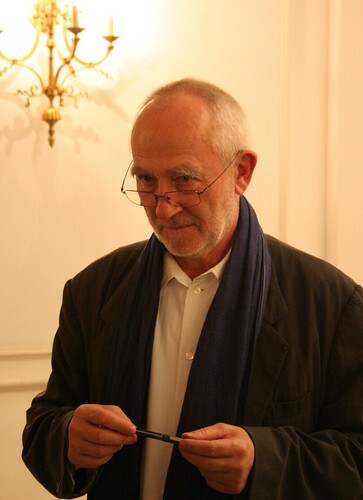 After the meeting ended, Zumthor instantly started fretting. He was hired to reconsider just the eastern part of the campus. The western end was a hodgepodge of buildings and parkland, he said, with a half-baked attempt at classical order. “I don’t understand this axis idea, like for the French king,” he said. “I’m too late.” He consoled himself with the prospect of devising paths and vistas around the campus for outdoor works of art by Heizer, Jeff Koons and Robert Irwin.